McGinnis has deployed his genius widely over the years. He’s crafted fronts not only for works of crime and spy fiction, but also for historical and Gothic romance novels. He has contributed to slick magazines and developed iconic posters for such Hollywood flicks as Breakfast at Tiffany’s, Barbarella, The Odd Couple, Cotton Comes to Harlem, and Sean Connery’s 1967 James Bond movie, You Only Live Twice. And he’s exercised “pure self-expression” through an assortment of gallery pieces, primarily portraits of women, rural landscapes, and Old West scenery. His colleagues at the Society of Illustrators recognized McGinnis’ expertise and prolificacy in 1993, when they elected him to the Illustrators’ Hall of Fame, an honor first bestowed on Norman Rockwell in 1958. Yet this “pop culture Rembrandt” (as he was dubbed by a magazine serving his current hometown of Greenwich, Connecticut) got his start in the book-cover biz illustrating crime novels. And more than half a century later, he’s still influencing that field. I have never met McGinnis, and I probably never will. 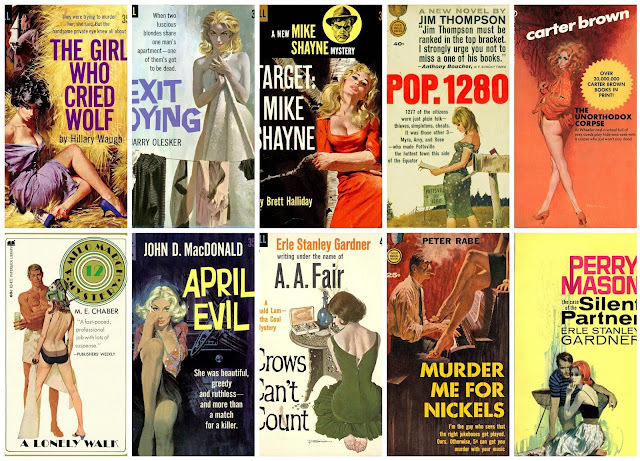 But I own stacks of the paperback books he’s graced with his artistry over the years, and I try to snap up any I don’t already possess, whenever I see them. He’s a master of his art, and it gives me great pleasure to pay tribute to his efforts in CrimeReads. Click here to learn more.